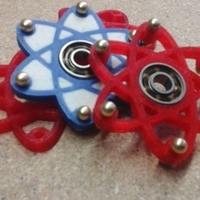 This contra-rotating spinner will create interesting geometric patterns and is just plain fun to play with. It is a fast print, with no support required, and a great conversation starter. I pressed in the bearing using a C-clamp with moderate effort, though you may need to sand or add a dab of glue if your printer isn't that accurate dimensionally.